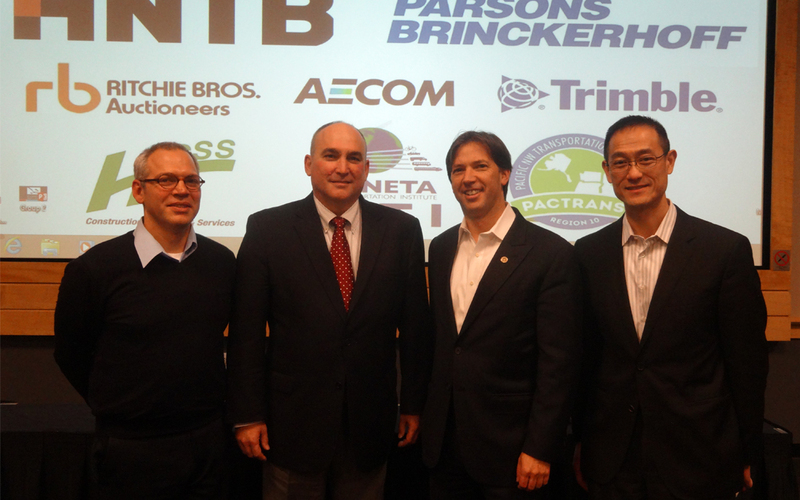 Photo caption: Left to right: HNTB’s Ted Zoli, Acting FHWA Administrator Greg Nadeau, HC Bridge Company’s John Hillman, and 3M’s Raymond Chiu. The term “big data” refers to large sets of digital information that can be collected and analyzed to learn about and predict trends and behavior. Experts from Microsoft’s Internet of Things (IoT) group as well as their partner, Aditi Technologies, showed attendees how big data is already being used to connect and enhance major European transportation networks like the London Underground transit system. Two state Department of Transportation chiefs, Lynn Peterson from Washington, and Kirk Steudle from Michigan, outlined their commitment to making innovative changes they hope will dramatically improve their states’ infrastructure as the use of big data in transportation-related decision making becomes more common place. Led by innovation thought leaders and industry experts, including Ross Smith with Microsoft, Ted Zoli with HNTB, John Hillman with HC Bridge Company and Raymond Chiu with 3M, participants were challenged to change their way of thinking as they worked in groups over the course of the workshop. As the attendees outlined plans to use big data to dramatically change the roadway experience in the U.S., they came up with game-changing programs, such as creating data hubs to better connect the commuter and infrastructure; using data to monetize transportation assets; increasing safety by being able to report real-time traffic incidents and re-routing traffic in accelerated speeds; and creating virtual games for the commuter to incentivize driver behavior. The three-day event also featured the presentation of the annual TransOvation Awards, which honor innovative transportation infrastructure-related products, services, technologies and techniques introduced over the past five years that can be documented to provide a high return-on-investment by improving transportation safety, saving taxpayers money, or making our transportation infrastructure more environmentally sustainable. The winners were EMSEAL JOINT SYSTEMS of Westborough, Mass. for their Bridge Expansion Joint System and Transurban for the 495 Express Lanes in Virginia.